Essential BBQ equipment numero uno is the Teflon® barbecue fish mat in my view because it has so many uses and it’s really easy to clean. 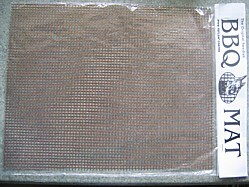 Essentially it is a mesh mat that has been coated with a non-stick surface. 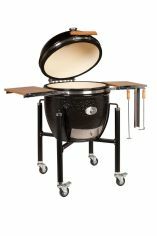 The holes in the mesh ensure that the heat gets through to cook your food and the juices are still free to drip down onto the heat source to deliver that smoky taste. So there's no compromise on flavor and the non-stick surface does...well, what you would expect, it stops your food sticking to the grill grates. 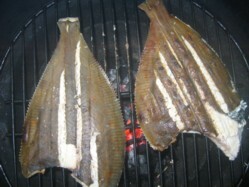 A mat will prevent fish sticking to the grill and breaking up. 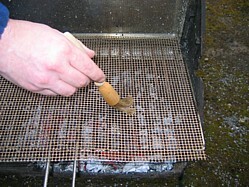 Even if you do have a mishap then the grill mat will stop your fish falling onto the coals. The same applies when cooking vegetarian food such as bean burgers or anything that could be of risk of breaking up. A clean mat provides an “uncontaminated” space on the grill for vegetarian guests. When finished cooking, pop it in the dishwasher an it’s ready for next time. You never get those dirty marks on your food that appear when the grill’s not clean. For this reason I always take a couple of mats with me if I'm going to the park or campground where I've got to use a communal barbecue. Here's an example of where a barbecue fish mat would have made all the difference to the presentation of the food. I have to say that I wouldn’t be without one and I even encourage my vegetarian friends to “bring one with them” when they are invited to a barbecue and that way they can eat happily without coming into contact with meat. TIP - Just lightly brush the mat with oil and drip dry before placing the mat on the cooking grate and you're ready to cook. To drip dry just hold it up and give it a shake, that way there won't be excess oil dripping onto the coals and causing the possibility of a flare up. Note: - As with all Teflon® surfaces the non stick doesn't last forever and if you do use the dishwasher then the abrasives in the cleaning tablet will shorten the life of the mat further. That said, they hardly cost the Earth so it's not not a big deal.